Meet a mongoose. Did you know that the dwarf mongoose is the smallest carnivore in Africa? Even so, these tiny creatures have big personalities. These mammals tend to be incredibly curious and sociable, quite similar to their meerkat relatives. Dwarf mongooses live in groups ranging from 8 to 30 individuals called a pack or troop. You will often find these energetic animals playing and grooming one another or searching for tasty insects to eat. With a length of 7 to 11 inches (18 to 28 centimeters) nose to tail, the dwarf mongoose is the smallest mongoose species. It has small ears, a pointed muzzle, a long, furry tail, and teeth adapted to its primarily insect-based diet. Their fur can vary in color, ranging from a reddish-buff to speckled brown. Watch out! Birds of prey and snakes are the primary predators of the dwarf mongoose. For this reason, the alpha male is always on the lookout and alerts the rest of the pack of any suspicious activity. He typically stands atop a termite mound to watch over the territory—and if he senses danger, he vocalizes to warn the other members of the pack. Unlikely bedfellows. Did you know that in the wild, dwarf mongooses and hornbills help one another? These animals have a mutualistic relationship (one that benefits both species), in which they forage for insects together and alert each other of any potential danger. The dwarf mongoose is the most abundant small carnivore found in Africa, ranging from Angola to Ethiopia and eastern South Africa. Within this large area, they inhabit open woodlands, thickets, and savannas. These inquisitive, active animals are nomadic by nature, and move from den to den in search of food. They use hollow logs, termite mounds, and rock outcroppings for shelter, as well as a safe haven for pups. Dine, dash, and diurnal. The dwarf mongoose is diurnal, spending its days scuttling about in search of food with their pack. In the wild, you will most often find them preying upon small vertebrates and insects. Those that are not foraging for food are caring for the young mongooses inside the den or possibly grooming and playing with one another. These carnivores primarily prey on insects—however, they have also been found to eat rodents, reptiles, eggs, and occasionally fruit. They occupy most of their day searching for food within the rocks, brush, leaves, and termite mounds. These animals are highly vocal and communicate with each other through a series of twitters, whistles, trills, and vibrations. They alert other group members of potential danger, as well as when it is time for the group to move on to another location. The alpha male is always on the lookout and alerts the rest of the pack of any suspicious activity. He typically stands atop a termite mound to watch over the territory—and if he senses danger, he vocalizes to warn the other members of the pack. Highly social animals, dwarf mongooses live in groups ranging from 8 to 30 individuals. The oldest male and female are the dominant members of the pack, as well as the only breeding pair. The female, however, ranks higher than the male and determines the group’s movements. The dominant male is in charge of keeping an eye out for danger, as well as protecting their territory. Within the remainder of the pack, there is a reverse age-based hierarchy, in which the younger mongooses hold a higher ranking than the older mongooses. It is likely this occurs in order to ensure that juvenile mongooses receive enough food and do not have to compete with older mongooses. The matriarch has two to three litters each year. She can have 1 to 6 pups at a time and nurses them for approximately 45 days. 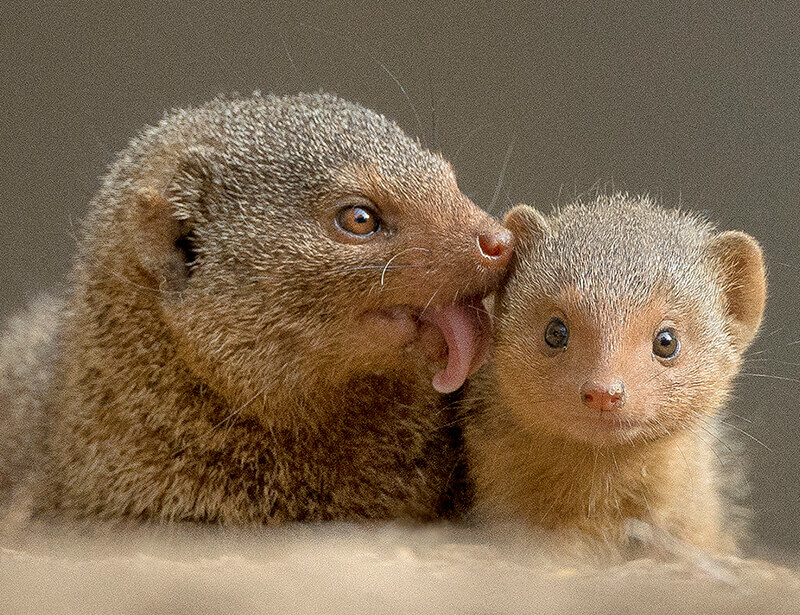 During this time, older mongooses bring additional food to the den and assist in the care of the pups. Once the pups are around six months old, they begin foraging with the rest of the pack. 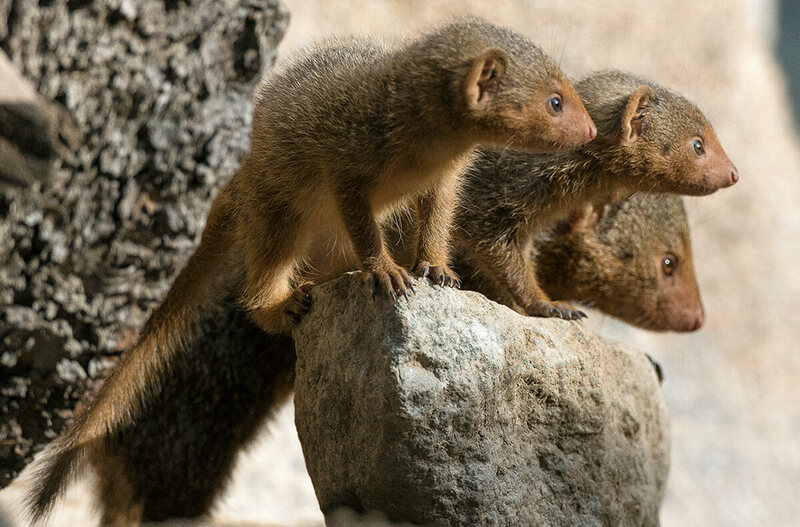 Dwarf mongooses can be seen in the Kopje habitat at the Zoo's new Conrad Prebys Africa Rocks experience. 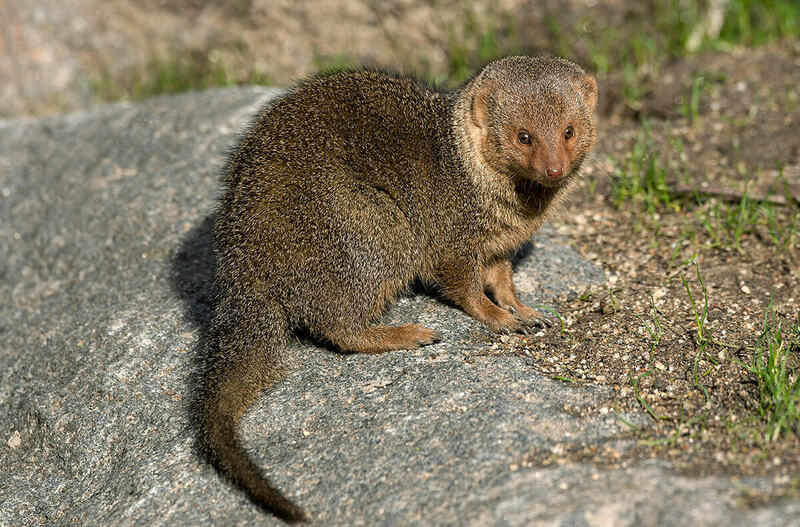 The dwarf mongoose is currently classified as a species of Least Concern on the International Union for Conservation of Nature (IUCN) Red List of Threatened Species. This species is quite common throughout its range and is prevalent in several protected areas. Fortunately, this species does not have any major threats. You can help us bring other species back from the brink by supporting the San Diego Zoo Global Wildlife Conservancy. Together we can save and protect wildlife around the globe. Dwarf mongooses and hornbills work together to find food and warn one another of predators. This species can sometimes be seen doing handstands, in order to mark their territory through scent marking. Dwarf mongooses are the smallest carnivores in Africa.